Pete's Cycle of Baltimore, Maryland, is proud to offer Suzuki's new KingQuad 400 lineup. 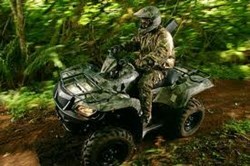 From being the first to offer the 4-wheeled ATV in 1983, Suzuki continues to offer machines of the highest quality. John "What a great smooth ride!" The world can pretty much thank Suzuki for the 4-wheeled ATV. It truly was the “First on 4 Wheels,” as the saying goes. The year was 1983 when Suzuki first introduced the now classic QuadRunner LT-125, a modest machine by today's standards, but groundbreaking for its time. Prior to that, it was a 3-wheeled world, the prize going to Honda in 1970 for introducing the first 3-wheeled ATV, the seven horse power US 90. Yamaha introduced its version of the 3-wheeled ATV in 1979 with the YT125. However, by 1988, ATV manufacturers ceased producing three wheelers after serious safety concerns were raised, notably by the U.S. government and other private industries. The new Suzuki KingQuad 400 lineup, available at all Pete's Cycle locations, exhibits just what has kept Suzuki in the business for so long--strength, versatility and durability. Thirty years later, Suzuki is still a top competitor. Whether it’s a joyride through the hills, a short hunting trip or hauling the logs in your backyard, this machine has a sporty edge combined with the muscle to complete the difficult jobs. The KingQuad 400 lineup also comes equipped with a new digital speedometer, a fuel-injected 376cc four-stroke, and industrial strength front and rear carrying racks that can carry just about anything, for as long as needed. And those are just a few of its new features. So, now what to do? Head for the hills, of course. Maryland has some excellent trails to give your machine the breathing room it deserves, and nearby West Virginia's Hatfield-McCoy trails boast 600+ miles of tracks, mountains and trails! But before the truck is loaded, be sure to call ahead and make sure seasonal closures don't spoil the weekend. Come on in to any one of three Pete’s Cycle locations—Baltimore, Bel Air, Severna Park--or visit Pete’s home page by clicking here.